The Irishwaterdogs Invitational was a great event again in 2011.The IWDI is an annual kayak fishing tournament held in Jacksonville, Florida each October. The goal for this event was to bring together anglers, paddlers, vendors and local charities to help raise money for the Cleft Palate clinic of Jacksonville, FL. The awards party that followed was the best part of this tournament. Meeting new people and listening to stories about the one that got away while enjoying good food, live music and cold beer is always worth the 4 hr drive for me. I would encourage all kayaks anglers to attend this great event every year. I know I will. About the Author: Steve Gibson is a Pro Staff member of YakAngler.com and a SW Florida native fishing the beautiful waters of Sarasota Tampa Bay. He operates Shallow Pockets Fishing which is Sarasota's premier kayak guide service with over 20 years of fishing experience. He specializes in targeting Snook, Redfish, Trout, and Tarpon throughout his region. 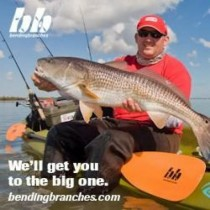 He is a member of team Florida Paddle Sports & Reellife Gear.